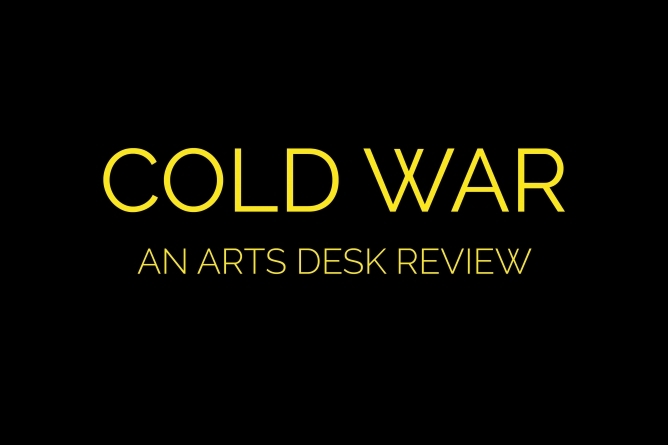 Last week, the Arts Desk saw “Cold War” at the Varsity Theater. The 2018 Polish black-and-white drama follows Wiktor and Zula, two artists who fall deeply in love. Their love story is set against the background of the Cold War and the Communist propaganda machine. Directed by Paweł Pawlikowski, the film was nominated for Best Foreign Language Film, Best Director and Best Cinematography at the 91st Academy Awards. I didn’t realize the impact of this movie’s emotionally profound and thoughtful story on me until I started crying at the rolling credits. The score, which featured Chopin’s “Fantaisie-Impromptu,” Dwa serduszka” and an Ella Fitzgerald tune, perfectly complemented the beautiful cinematography. The love between Zula and Wiktor is like two rivers flowing side by side, meeting each other at times, and eventually spilling out into the same deep ocean. The suffering and indulgence of these two lovers is a spectacular must-see. I was able to Shazam the whole movie, resulting in my new favorite Russian folk music playlist on Spotify. Besides the tear-jerking score and soundtrack, the more I contemplate the intricate scenes of this black-and-white masterpiece, the more I find myself wondering why this film didn’t win every award there is to win at the Cannes Film Festival. I’m going to see this movie again this weekend. The camera shots are too beautiful, the on-camera chemistry is too convincing and there is so much depth to the plot that one viewing won’t suffice.